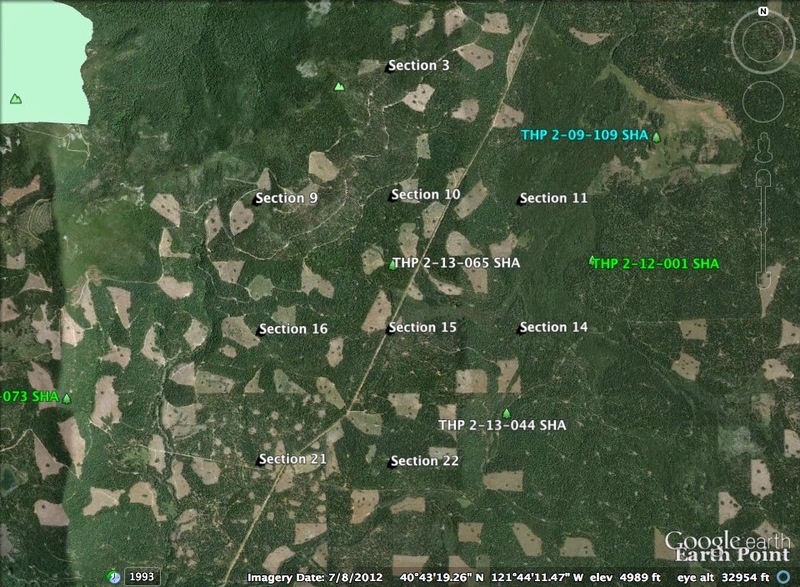 THPBlog: Sierra Pacific Industries to clearcut log SW of Burney, CA on the Sierra Crest. Sierra Pacific Industries to clearcut log SW of Burney, CA on the Sierra Crest. THP 2-13-065 SHA (Howard’s Garden THP) Sierra Pacific Industries, 510 acres; 99% clearcut, 1% selection, misc roadside logging. Huckleberry (MD: T33N R2E Sec.3, 9, 10, 11, 14, 15, 16, 21, 22). Winter operations, moderate erosion hazard, slopes up to 50%, 11 road drainage work sites, wet areas, herbicides, goshawk nests near unit 14A, scattered large trees. Estimated public comment deadline: 11/07/13. This THP is about 9.5 miles SW of Burney, CA near the Sierra Crest at an elevation of 4,700 to 5,800 feet. Sierra Pacific Industries is planning a tractor based clearcut logging operation in ponderosa pine, white fir, incense cedar, sugar pine and Douglas fir forests. The THP area drains into “the gardens,” a large meadow/lodgepole flat that drains northward towards Burney and the Pit River. Three short spur roads are planned to access units, and there are 11 road drainage sites planned for work including dip construction, rocking and culvert maintenance. Three goshawk nests were reported near unit 14A, and upswept moonwort and scalloped moonwort were found near unit 15C. More information is available on the THP Tracking Center website.